Budowsky: Biden or Beto: Where's the beef? 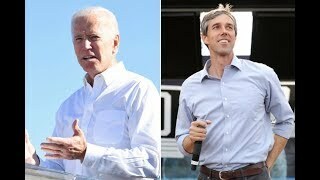 With former Rep. Beto O'Rourke (D-Texas) campaigning across the nation offering high-sounding slogans and much talk about himself, and former Vice President Joe Biden poised to present himself as a candidate to lead the nation and free world, it is time to ask big questions. In 1984, former Vice President Walter Mondale effectively but unfairly asked about then-Sen. Gary Hart (D-Colo.), a brilliant and exceptional candidate for president: "Where's the beef?" This is a fair and vital question that will be increasingly asked if a Biden announcement clashes with the manic attention now surrounding the O'Rourke campaign. O'Rourke immodestly believes he was born to run for president, suggesting some higher authority granted him a destiny to become the most powerful man on earth. For now Beto O'Rourke provokes endless fascination. Where is Beto today? Why does Beto wave his arms frenetically? Did Beto emerge from his funk? Will Beto film another visit to the dentist? Does Beto look like Robert Kennedy? Look how much money Beto raises! What does he stand for? Is he a liberal or a centrist? What did Beto mean when he said his wife raises their children, sometimes with his help? Unlike Sens. Bernie Sanders (I-Vt.) and Elizabeth Warren (D-Mass. ), O'Rourke has not spent a career championing great progressive causes and proposals. Unlike Sen. Amy Klobuchar (D-Minn.), he has not repeatedly won reelection to high office and worked at high levels promoting big plans to make America better. Unlike Sen. Kamala Harris (D-Calif.), he has not been elected to state office, and the Senate, and proven a passion for strong values and far-reaching proposals. Unlike Biden, he is not widely admired by Democratic leaders around the world, nor does he have vast presidential-caliber experience. What exactly has Beto done that qualifies him to be leader of the free world? If Beto is the leader to prevent the world from being destroyed by climate change, why has he accepted massive donations from the oil and gas industry while claiming he does not accept special interest money? Where's the beef with Beto? Marketing himself through his first name nickname, Beto aspires to be the Madonna of presidential politics, though unlike Beto in his chosen field, Madonna has an enormous repertoire of brilliant work and career achievement in hers. Whether they favor these candidates or not, voters and commentators will not be asking of Biden, Sanders, Klobuchar, Warren, Harris or other candidates what some have begun asking of O'Rourke: Where's the beef? In 2018 I was an early, strong and proud supporter of Beto O'Rourke for the Senate, but with all due respect cannot find any outstanding achievement, accomplishment or qualification worthy of the presidency in a dangerous world. By contrast with other leading candidates, he announced for president without having thought through a candidacy about much more than a cult of personality and appealing platitudes without presidential-caliber substance or depth. Biden ably served as VP under a popular and successful president, Barack Obama. By contrast, Vice President Pence often acts like a simple cheerleader, fervently nodding approval for statements and actions reasonable people might believe he privately deplores, done by the president who repeatedly insults even great American heroes like John McCain. If Biden is nominated and gives a speech at the site of the fallen Berlin Wall, he or any Democratic nominee would be greeted by what could be the largest crowd in human history, by European believers in democracy cheering the return of America to the leadership of the free world and cheering the values of freedom, justice and democracy that our president, nation and allies must always stand for. My favored candidate was Sen. Sherrod Brown (D-Ohio). It is sad for American democracy when a leader like Brown chooses not to run while a politician like O'Rourke believes he was born to run. The candidate Democrats need will offer big plans for the greater good with the depth and appeal to win, without asking: "where's the beef?"